After four months since I wrote something about the hydrocarbons sector (and by they way it was vetoed) I don´t want to miss these holidays to share something with you. The two major export markets for Bolivian natural gas are Brazil and Argentina, the first one agreed during the last thirty years and the second one activated in 2004 and consolidated later. The fact is that the people (like me) whom dedicate our time to study this sector, from time to time, try to elucidate a reality that many times is out of our hands. Well, this time I want to present some realities Bolivian natural gas exports to Argentine. For that I used ... Oh, how ironic! Data published by the Ministry of Mining and Energy of our brother country where information is published until November 2016... something that deserves my most sincere congratulations. There is no doubt that the agile and transparent information reflects that there is nothing to hide. 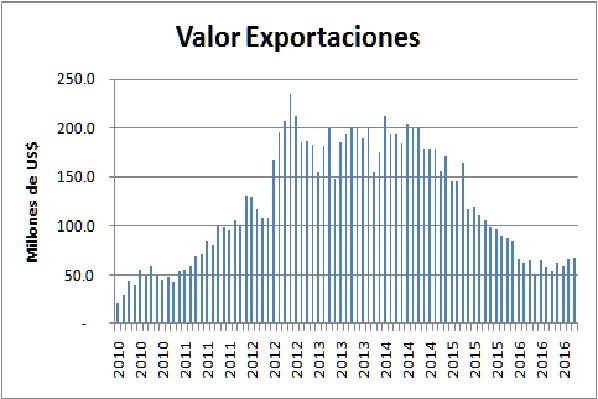 Below there´s a graph with the monthly value of natural gas exports from Bolivia to Argentina… now, maybe, the reference to the title is a bit more clear: This is how a cycle looks like. In 2010, the monthly value was around US$ 50 million, by 2016 was slightly higher. In this sense, the following question then arise: What factors explain this cycle? Let´s go by parts then. 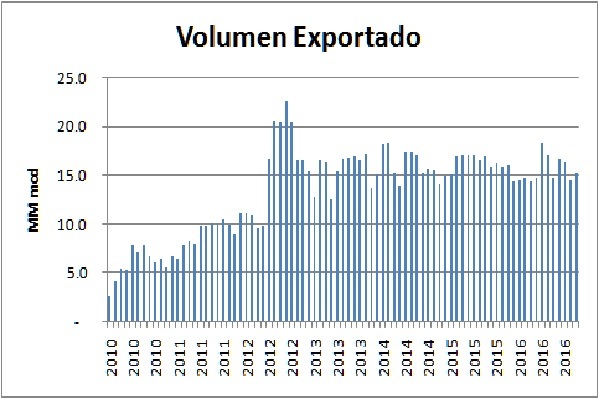 The following graph shows the export volume (expressed in millions of cubic meters per day) during the same period of analysis. It´s clear that the cycle´s "ascending" part is because, among other things, an increase in the volume; after this climbing part this variable stabilized at 15 million cmd. On the other hand, the "descending" part of the cycle is seen in the following figure. 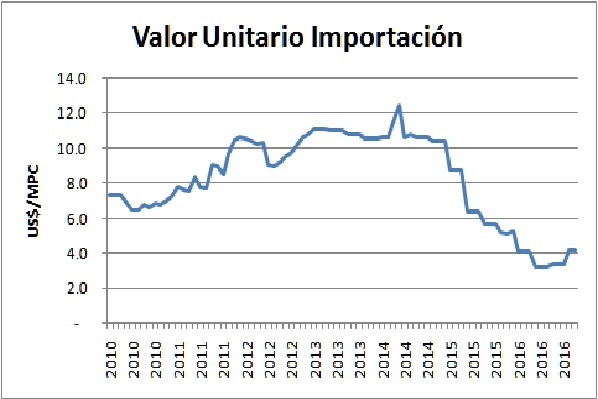 In it, I present the unit value of natural gas imports from the Argentine perspective, under normal conditions (which certainly exist), this behavior should also be observed in the unit value of exports from the Bolivian perspective. Note, dear reader, how the prices of the years 2015 and 2016 were well below the "lived" in the past. 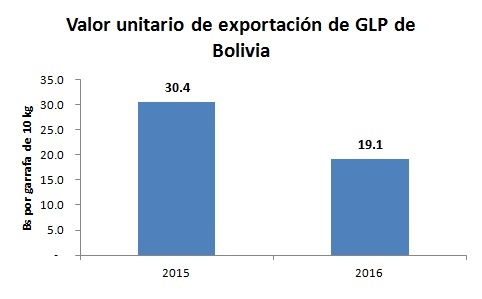 When international oil prices started their declining phase (and so did the Bolivian gas export prices), there were few voices (in Bolivia’s Government) explaining to the population that such decrease would be offset by an increase in the natural gas production. The data... these stubborn data, tell us that this offset didn’t happen. Last week we were talking with Santi (my 8 years old son) about the life problems and how to get out of them, while he was trying to tied his shoe’s laces he told me those captivating phrases that children say, without even realizing them: "Dad, everything is a question of will". An excellent 2017 for all of us, that those pains that sometimes bitter our hearts can be offset with a clear positive attitude towards life, so the cycles... that we live from time to time be more bearable. La Paz, December 30th. 2016. 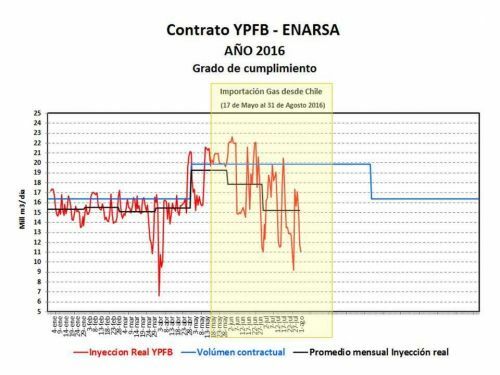 According the Ministry of Energy and Mining of Argentina (see link) the average monthly natural gas import volumes from Bolivia to Argentina are below contractual agreements, see the black and blue lines of the figure. This situation necessarily involves the activation of contractual clauses between the two countries. According the Natitonal Institute of Statistics in Bolivia (and La Razon newspaper) during 2016 LPG export volumes "nearly tripled" (see link), but the unit export value (say the price) declined by just over 37%. For a national equivalent, in 2015 LPG "export price" was (approximate) Bs 30.4 the balloon of 10 kg and in 2016 this "price" dropped to Bs 19.1. Naturally this decrease occurs because international oil prices fell in recent months. How can we compare LPG exports value with natural gas exports? Have a look of the data: natural gas exports until June 2016 = 3,036 million US$, LPG exports = 8 million US$.